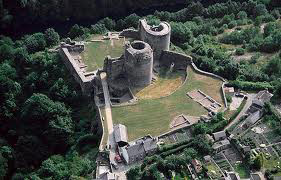 Cilgerran Castle is a 13th-century ruined castle located in Cilgerran, Pembrokeshire, Wales, near Cardigan. Pencil sketch by Claude Buckle captures faithfully the area as it was in 1933. This sketch was used as a menu picture to publicize the benefits of the area. 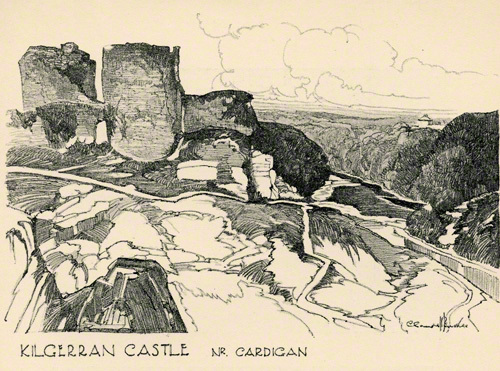 GWR (Great Western Railway) called it Kilgerran, which was not popular in the village, preferring to use the English name instead of the Welsh Cilgerran. A railway station however existed at Cilgerran and had a single platform. It was closed in 1952. The castle sits on a rocky promontory above the River Teifi. The castle is largely ruinous, though two substantial towers remain. From the castle there are pleasant walks down to the River Teifi. A small castle which has a lot of history. Created in 1933.